The 13th Annual CIP Transportation & Logistics Conference "Investment Strategies" panel on Oct. 27. Pictured left to right: Georgia Kokkinias, Ellas Commercial R.E. ; John Telford, Seyfarth Shaw; John Abuja, Marcus & Millichap; Jerry Rotunno, Associated Bank; and Michael Brennan, Brennan Investment Group. 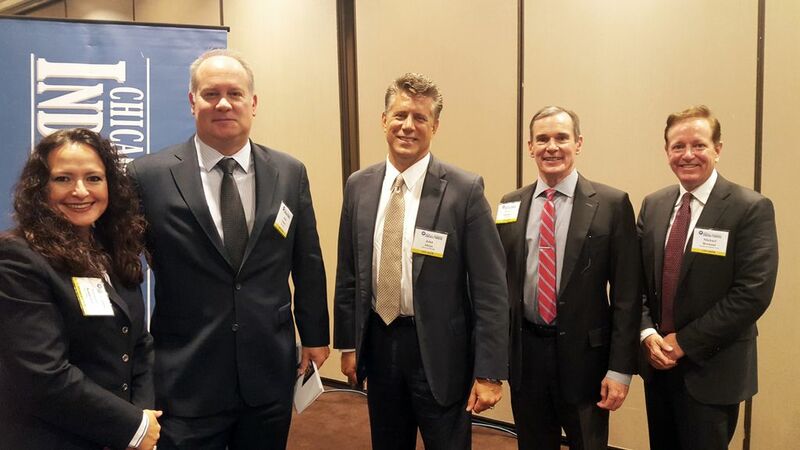 On October 27, Jerry Rotunno, Commercial Real Estate team lead, Associated Bank, was part of the investment strategies panel for the Chicago Industrial Properties’ 13th annual Transportation & Logistics Conference at Crowne Plaza Chicago O’Hare Hotel. Rotunno addressed the topics of submarkets in Chicago and the current regulations as it relates to banking and businesses’ ability to get an industrial loan. Secretary Randall S. Blankenhorn, Illinois Department of Transportation, served as the keynote speaker. More than 250 commercial and industrial real estate professionals joined the conversation on the state of the market-new trends and activity, as well as the challenges affecting the industry and investment strategies, through a panel series of speakers.